Accidental damage is often caused by professional construction trades in London. Royal repair dent and chip repair experts are here to help you. It will be cheaper to call us than to use your public liability insurance. Mike is professional tiler from Loughton. 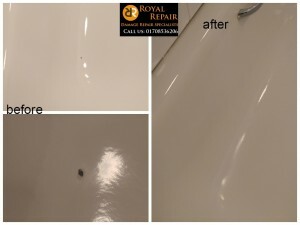 He was working in one of very posh houses in Knightsbridge, central London, when accidently dropped tile and chipped bath. Our chip repair specialist was in neighbourhood and was happy to come and help desperate Mike.